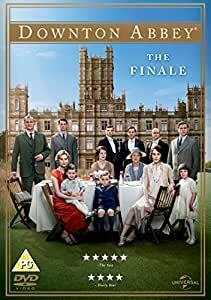 Amazon's Choice for "downton abbey the finale"
Final episode of the award-winning ITV costume drama following the lives and loves of those above and below stairs in an English stately home. In this special, set in late 1925 and early 1926, everyone reunites for Edith (Laura Carmichael) and Bertie (Harry Hadden-Paton)'s wedding on New Year's Eve while Anna (Joanne Froggatt) prepares to give birth. Elsewhere, Carson (Jim Carter) reveals to his wife that he suffers from a hereditary illness known as the palsy, which makes him question his role at Downton, and Lord Merton (Douglas Reith) tells Isobel (Penelope Wilton) about his own illness but retains his desire to marry her. However, his daughter-in-law Amelia (Phoebe Sparrow) keeps Isobel from seeing him. Will the year end happily for those at Downton Abbey? As 1926 arrived England was still in the early stages of transition from old society to more inclusive one where those in traditional service to the land owners can go on to become teachers. The old estates have to be open to new forms of business and diversify to remain in existence. Mary aided by her new husband and Tom, provides a more a forward thinking outlook compared to her father, who while accepting modernisation still has roots based on the past. This indicates that Downton is not left requiring an imminent bale out by the National Trust. An example of new opportunities is demonstrated when the latter two form a new business as car dealers. The household staff is trimmed down but largely as a result of the new opportunities taken up by staff. Lady Edith all ready a magasine owner manages to advance further, but as an indication that the old society still survives this is is achieved via a more traditional route. Mrs Crawley and Lord Merton make their own breakaway with a prompt in the form of a health scare. Lady Grantham settles into her role as overseer of the modernisation of the local hospital. As the new year arrives the Dowager Lady Grantham drinks to the future but rues not being able to choose the alternative of returning to the past. What we don't know is how far into the future Downton will remain self sufficient, or what will become of it when World War II arrives. Just binge-watched my way through Season 6 and the finale, and every time the intro came (one of the most glorious and memorable features, alongside the catchy, unmistakable musical motto) I felt like I was saying good-bye to the names of the actors which had become so familiar over the years, somehow wishing them well in their real lives, but secretely including well wishes for the characters they had brought to life. So, without becoming too sentimental, I genuinely was somewhat melancholy, like leaving friends behind - say in a far-away country - after having spent a wonderful time with them and now knowing that a reunion will be out of the question. How welcome they made me at Downton, how generously they shared their troubled, but also magical lives with me, what a comfortable haven their home and their family story was to me. My sincere thanks also to Mr. Fellows, the skilfull puppeteer behind the scenes, who created this absorbing and thoroughly entertaining (in the best sense of the words!) story. And my thanks and respect to all the actresses and actors who chose to stick with the story to the end so that a believable continuity could be maintained. The loose ends all became happy ends, and that was satisfying the eternal optimist in me who likes to believe in Goodness and Love. So - fare well in the next decades, all you Crawleys and spouses, I hope you have made it safely into the 21st century. Downton is Marmite: love it or hate it. I don't understand the Anti lobby. Yes, it has temporal flaws. Yes, the story does get out of control and unbelievable to the Antis. Yes, it is about 'toffs'. Yes, it is about spoilt adult children. But it's also about below-stairs life in service: the good, the bad, and the others. And it's about the demise of a way of life. The acting is mostly excellent. The setting is beautiful. Does Downton Abbey need a review? Viewer numbers and associated sales say enough don't they? Having said that--the finale tried to do too much. The slow life that many of us enjoyed depicted in this story suddenly tried to wrap people's lives up in what seemed like a few days which, even in the 21st Century doesn't happen. Not with so many people at once in the the one place anyway. I watched the whole series back to back and enjoyed it so much. I have recently read that they are now making a film which is due out later this year that is great news and I look forward to seeing it. 5.0 out of 5 starsMust this be the end? I have thoroughly enjoyed the whole of Downton Abbey with all its twists and turns - and there are still openings for it to be ongoing, even if it takes us away from Downton itself. Please Julian, give us some more. My favourite series so far. Most people think it would be boring but it's full of surprises that makes you want to keep watching!